A Silver Alert has been issued for a missing 8-month-old, Indiana State Police said today. Amiah Robertson of Indianapolis was last seen at 4:35 p.m. Saturday, state police said. Amiah is 23 inches tall, has blonde hair and blue eyes, is believed to be in extreme danger and may require medical assistance, police said. 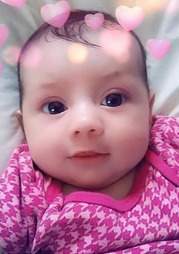 Anyone with information about Amiah is asked to contact the Indianapolis Metropolitan Police Department at 317-327-6540 or dial 911.